My academic book, Kafka and Wittgenstein, is currently at the printer’s. Here’s a fun fact about it: It almost didn’t have an index. Because I decided $1100 of my own money was already enough to be in the hole for this book ($800 to a very nice and thorough grad student for putting the damn thing into Chicago; another assorted $300 of printing/mailing/UPS-store-related things, all thanks to my lack of institutional affiliation and printer), I insisted on doing it myself, while I was going through proofs. My disgraceful proofreading coincided exactly with a two-month stay in the backwoods of upstate New York, wherein some yokel “computer doctor” managed to make my broken computer even more broken (and charge me $70 for the pleasure), and thus said index, unimpressive to begin with, consisted of about four pages of handwritten gibberish on one of my mother-in-law’s extra notepads. When I finished, I stuffed those Blätter into the outer pocket of my suitcase, and schlepped that suitcase from New York to Oregon, to visit my parents and get a nominal amount of child care (the Schumans, for alleged retirees, lead really busy lives). I did not give said index another thought until about a week ago, when I got an urgent email from my editor. Where was it?!? “No problem,” I assured him, the veritable Alf of his author roster. First, I noticed that my stupid dark-red Samsonite suitcase was not in the closet where I’d left it. In a flash, a memory from three days prior: My mother, stuffing a stupid dark-red Samonite with spandex and Bakhtin volumes, in preparation for a two-week bicycle tour/lecture trip in Italy (I told you she was busy). Oh no. No no no no no. 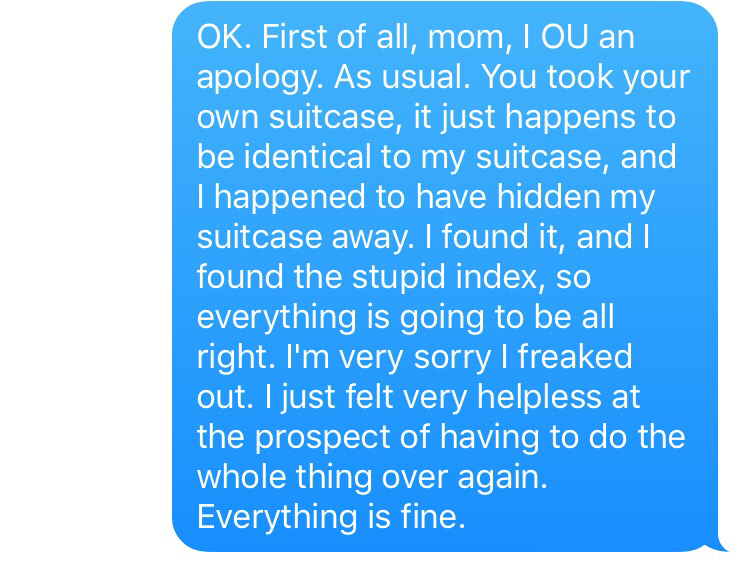 We had identical suitcases and she’d taken the wrong one. 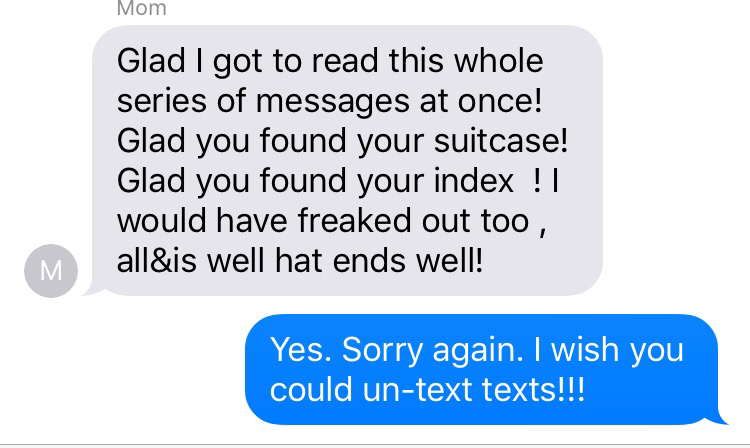 It was about midnight in Italy, and thus an excellent time to begin sending my parents irate texts. 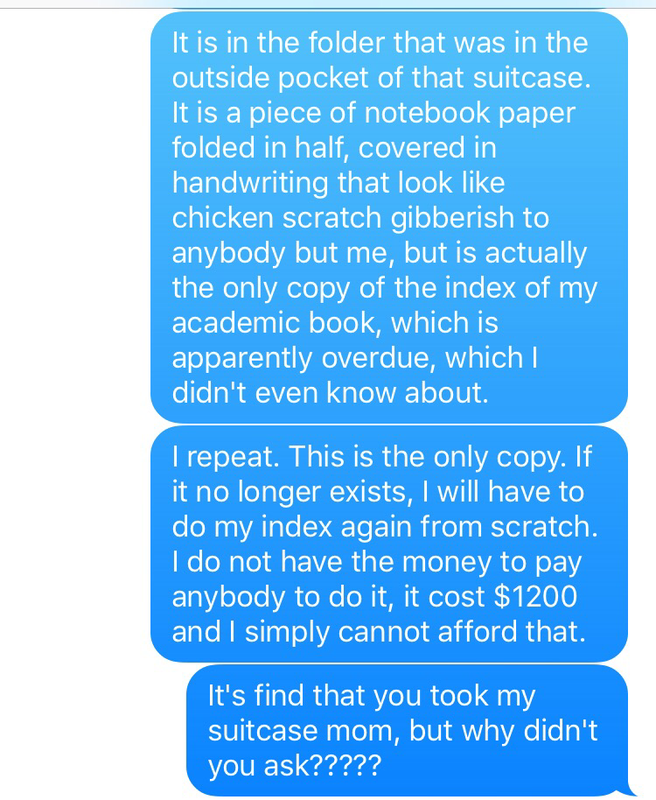 When these resulted in completely expected silence, I reacted to the resulting powerlessness and increasing desperation by texting more insipid details, and then asking questions to which there were no answers. 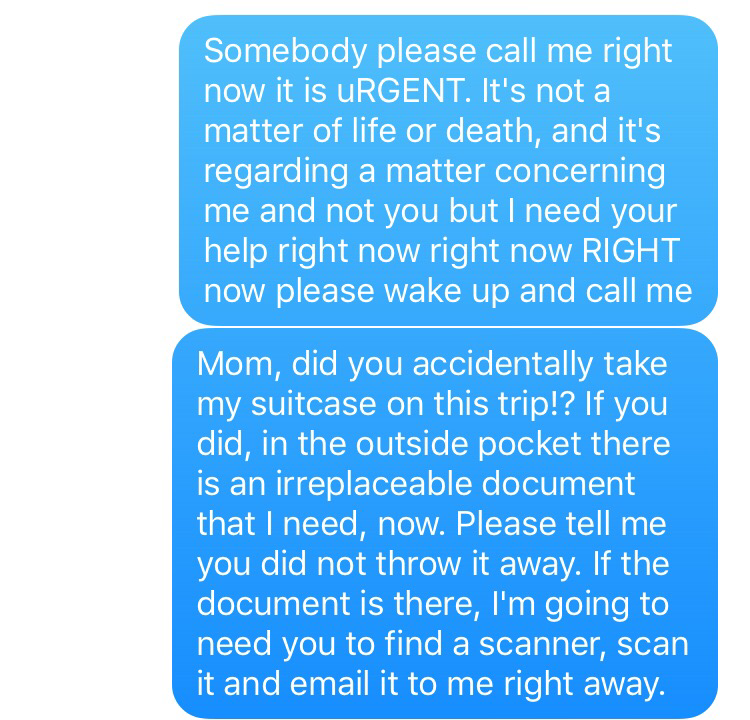 With my parents INSENSITIVELY IGNORMING ME, my only recourse was to stoop to their level, dig out the paper itinerary they’d given me (ugh), and dial up their Italian hotel on a landline (UGH). Given that it was midnight and they were on an oldies’ bicycle holiday in the middle of the Tuscan countryside, I did not get a peep from the front desk of what I am sure was an exceedingly laid-back little Agritourismo staffed by 500-year-old ladies who went to bed at 7:45 and spoke no English. The only understandable reaction to this development was to continue lashing out into the veritable Nietzschean abyss that was my parents’ switched-off iPhones. The idea—the very idea—of having to read through those proofs again, spending one more second (much less ten more hours) staring at the book that was supposed to be the beginning of my academic career, but actually post-dated its death by two years, was torture. And the idea—the very idea—of going another $1000 in the hole, for a book that was not going to do a single thing for me, was unimaginable. I grabbed a cushion off the couch and screamed into it at the top of my lungs, so as not to alarm my 8-month-old, who at this point was finding the entire situation endlessly amusing. And then—throat hoarse, hands shaking, tears flowing—I realized that neat-freak me had put my stupid dark-red Samsonite inside a larger suitcase to save space. It was still there. The only existing copy of that godforsaken index was safe and sound. I definitely had some explaining to do to my mom. Luckily, Sharon Schuman swears like a sailor and has been privy to my emotional outbursts for 39 years. I wish I could indeed, Mom. I wish I could indeed. I haven’t even read this, and I already love it, just from the preview texts that showed up in my WordPress headline. It’ll be Tuesday before I have the time to read it in detail. But it is already perfect. I did the indexes for 2-3 of my books myself. Fun in a geeky way. I also read a whole book on indexing. At least one has jokes in the index. Rebecca, any time you’re in danger of an index-related meltdown (or editing-related meltdown, etc.) — feel free to get in touch. You get discount!